Susan Orlean’s classic work of reportage, “The American Man At Age Ten,” is on the curriculum of every non-fiction writing course of the last quarter-century. The 1992 Esquire profile is a pioneering work of magazine journalism, as much for its execution as its this-would-never-work elevator pitch: “Susan Orlean hangs out with a random 10-year-old boy and writes about it.” Except, she wrote that story with such verve and sweetness, it illustrated how few writers think about the way we live, ponders its minutiae, and tease out the threads of significance on the level of Susan Orlean. Her newest book The Library Book is about libraries, through the lens of a forgotten fire at the Los Angeles Public Library in 1986 that destroyed or damaged more than a million volumes. In her compelling Orleanean way (see also The Orchid Thief), the story begins with a mystery, zooming out to a world you didn’t realize was inhabited by obsessives and eccentrics. I mean, librarians! 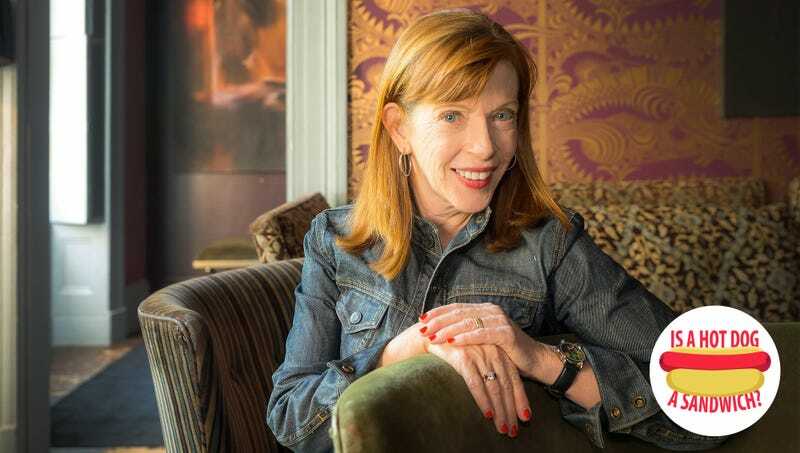 So if The Takeout had the opportunity to approach one person, someone with the analytical bandwidth to ruminate on a question so stupid as whether a hot dog is a sandwich, the obvious choice would be Susan Orlean, right? The Takeout: Hey Susan Orlean, is a hot dog a sandwich? Susan Orlean: I’m really glad that you’re taking on this question. I feel like this is a question that should be asked, and it’s not being asked enough. This is an important moment for me to be able to share my opinion. My position is it’s so obviously not a sandwich. SO: I spent about 22 seconds struggling with it, and came out very clearly on that side. You cannot have a tubular sandwich. I’m thinking the overall effect of tubular-ness. It’s a tubular insert plus a tubular overall shape. I’m sure you can make a sandwich out of a tubular item, like a sardine. But hot dogs, it ends up being overall tubular, which doesn’t seem like what a sandwich is. I just think you need the parallel-ness of the bread. To me, that is a diagnostic feature of a sandwich. It’s like asking if pigs-in-a-blanket is a sandwich. That’s not a sandwich. A sandwich is two parallel pieces of bread with something in between. TO: This is an argument taken up by many of our respondents, to which I counter with bread that wraps around in a single continuous C-shape, like some sub sandwiches. SO: There are sandwiches where there is a continuity of the two pieces. I don’t think the mere existence of the connection between the two pieces of bread distinguishes it or disqualifies it as a sandwich. But I think the bread has to be parallel throughout most of the sandwich for it to qualify. I hate to be so technical, but I think you need to be. Also, If someone invited me over for a sandwich and handed me a hot dog, I’d be horrified. To me that’s bait and switch. You promise me a sandwich and give me a hot dog—I’m not saying I wouldn’t want a hot dog, but that’s not advertising accurately. Language is one of those things that is defined by usage. If someone said to you, come on over and have a sandwich, you would never picture a hot dog. If you did, I think you’ve got some issues. TT: Is this the most you’ve ever spent thinking about this? SO: About hot dogs? Yes. But it’s certainly not the most I’ve spent thinking about things that make no sense. Nor is it the first time I’ve spent a really long time thinking about a very specific subcategory of life. I also think that’s been the definition of my career, which is to think hard about things that haven’t been thought about very much. So you’re in my sweet spot. By the way, I’m getting a manicure while doing the interview, and everyone in the salon is listening to me in wonder and awe. TO: Even if you believe in the existence of an infinite universe, I guarantee you Susan Orlean being asked about hot dogs while getting a manicure has never before happened throughout our, or any existence. SO: We’ve just disproved string theory. Hey Snoop Dogg, is a hot dogg a sandwich? Hey Peter Sagal, is a hot dog a sandwich?